Within months of my 18th birthday, two things happened that continue to impact my life 34 years later. While taking a shower in the Manhattan apartment I shared with a roommate, I slipped and landed on my lower back and tailbone. To put the impact I experienced into context, the bathtubs back then were made of cast iron and covered with porcelain. Although I didn’t feel much pain immediately afterward, within a few weeks I was experiencing cold sweats and blinding headaches. The pain was intense. A few months later, my therapist gave me the second and third diagnoses of the year: Post-traumatic stress disorder and a panic disorder — the results of being raised by an abusive father and an alcoholic mother. I had been plagued with night terrors since I was about 10 years old, and I experienced multiple anxiety attacks each day. After seven years in therapy, I was able to get a handle on the night terrors, but the panic attacks never abated. I remembered my therapist telling me about the relationship between depression and anxiety and lower levels of serotonin, but it didn’t make a lot of sense to me back then. There was little known about selective serotonin reuptake inhibitors (SSRIs) in the early to mid-1980s, so that wasn’t a viable treatment option. Antidepressants were an option, but earlier products on the market were fraught with problems, so I decided against using any. I did continue taking Vicodin, however, but only half the recommended dosage — I lived in fear that I’d inherited the addiction gene from my mother. So, instead I lived in constant pain. In the 30-plus years I used Vicodin for pain, I constantly monitored myself for signs of addiction. After I got married, my husband and I moved to California in 1998. My father died three years later, and because we were unable to resolve our fractured relationship when he was alive, I became profoundly depressed and nonfunctioning. Back in therapy, my new doctor suggested I go on meds for just a few months. Everything was so dark and, outside of my marriage, I had no joy in my life. I tried two SSRIs — Paxil and Zoloft — both with disastrous results. The former made me sleep 18 hours a day, so my doctor switched me to the latter, which brought my blood pressure down to 70 over 50. I refused to try anything else. The major depression lifted after a few months in therapy, but I continued to have multiple panic attacks a day and frequent bouts of nervous stomach. Fifteen years later, my husband and I were living on a farm on the Caribbean island of Puerto Rico, and medical marijuana was legalized by executive order. Shortly after dispensaries started opening on the island in 2017, I got my medical marijuana card so I could ditch the Vicodin permanently. While I never developed a dependence or an addiction, I was afraid of killing my liver. I consumed cannabis for chronic pain, migraines and insomnia. I wake and bake, and continue consuming throughout the day and into the night. I’m often asked how I can be a writer and be stoned all day long, and the simple answer is, I can’t. During the day, I consume strains that are high in CBD and lower in THC — ACDC is my go-to for pain. With a 20:1 CBD-to-THC ratio, I can get all-day pain relief and experience no psychoactive effects. Mango Haze can knock out my migraines within seconds of the first hit — regardless of whether it’s in the aura stage or it’s full-blown. At night, I like Hindu Kush either straight or as part of the three-strain hybrid known as Money Maker. I have no idea how much THC there is in either of them, but I imagine it’s high. I’m sleepy after just a few tokes and out like a light after a few more. Over time, I began to notice something completely unexpected: Although I wasn’t using cannabis to treat anxiety or asthma (it wasn’t approved for anxiety back then and it’s still not approved for asthma), I realized that both had all but disappeared. I had chronic asthma and constant bronchitis when I was growing up, and sometimes it would develop into walking pneumonia if I didn’t get it treated immediately. And 10 years of living in the humid tropics of Puerto Rico didn’t do me any favors. With cannabis, I went from multiple panic attacks a day to a couple a month, and with the exception of one bout of bronchitis last year, I now breathe much easier and threw away my inhaler for good. Cannabis is often accused (mostly by those who oppose it based on outdated information) of causing everything from asthma to lung cancer, but in reality, CBD is a natural anti-inflammatory that can help treat the very thing it’s accused of causing. When someone experiences asthma, their air passages are obstructed, making it difficult to breathe. CBD opens the blocked passages to allow breathing to be less labored, and in many instances completely normal. There are two side effects — one negative, the other neutral — I experience when I consume cannabis: persistent dry mouth, which I don’t love; and the absence of dreams, which I’m not sure how I feel about. But when I compare those with the adverse side effects of many Big Pharma drugs, there’s no comparison. Plus, I’ve never taken a Big Pharma drug for one indication and been pleasantly surprised to find it treated another, let alone two. I asked daily cannabis consumers I know if they have experienced unintended positive side effects. As it turns out, I am not alone. Lori Day has suffered from severe insomnia for 25 years. She began consuming cannabis in her 40s and got her medical marijuana card at age 52. She experimented with different strains and methods before she hit upon capsules. She takes one indica capsule and one CBD capsule at bedtime. She’d tried so many pharmaceutical and modalities of therapy over the years, but nothing worked as well as medical marijuana. Whereas I use an indica strain that’s high in THC to treat my insomnia, Day found THC alone to be too strong for her. 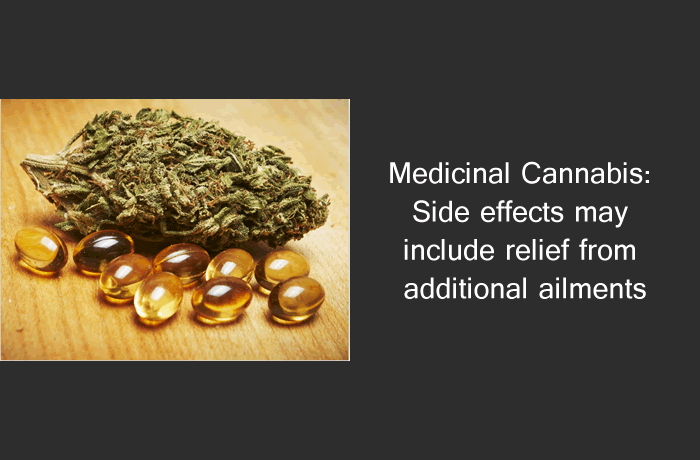 As part of a medical cannabis study at McLean Hospital in Massachusetts, Day says the research assistant suggested she add CBD to her regimen to cut or balance the THC. Then something magical happened: After less than a week of using this combination of THC and CBD capsules, the arthritis in her hands disappeared, which has helped her tremendously as a writer. Nurse Jessie Gill took up vaping and eating cannabis in 2015 to manage her chronic pain after suffering a spinal injury. She had to immediately cease being a bedside nurse, as the pain “was indescribable,” Gill says. “I tried every treatment option you can imagine. Nothing worked.” She reluctantly tried cannabis and it changed her life. Not only did consuming weed melt away her pain, she immediately became a staunch cannabis advocate. Gill was diagnosed with asthma at the age of five. Depending on the season, she required the use of a rescue inhaler between two and 14 times a week for as long as she could remember. She also had yearly exacerbations that required steroid treatments. Like most of us, Gill was concerned that inhaling cannabis vapor would aggravate her asthma, so she was amazed to discover that cannabis can act as a bronchodilator. After three years of daily cannabis use, she now uses her rescue inhaler once or twice a month and hasn’t needed steroids at all. Gill’s go-to strain is Death Star — it makes her feel balanced and is the one strain that truly relieves her nerve pain and muscle spasms. With 27 percent THC, Death Star is an indica-dominant hybrid and has also been used to treat anxiety, stress, headaches and depression. Getting her life back, Gill turned her love and advocacy into a new career: Writing about cannabis. Mary Rose Lee has used cannabis for the past seven years to treat frequent migraines and chronic nausea, with superior results to using over-the-counter and prescription remedies. But what came as a surprise to Lee was that she has been able to reduce her daily anxiety level by as much as 90 percent, allowing for deeper, more restful sleep. This also resulted in a reduction in PTSD and night terrors. Chronic cannabis consumers routinely report a disruption in dreaming. For many of us who consume cannabis regularly, a lack of dreaming is something we’re willing to accept, given all that we gain in return. For someone accustomed to having night terrors, this can be a welcome side effect. One strain that the budtenders at Lee’s local dispensary recommend is Purple OG, an indica-dominant hybrid that combines Purple Kush and OG Kush. The effects of this strain include feeling calm, hungry, couch-locked and eventually sleepy. When Lee doesn’t want to spend the entire day on her couch, she reaches for Space Queen or Candyland, a 50/50 hybrid comprising Grandaddy Purps and Platinum Cookies. Users of these two strains report being euphoric and creative, and free from stress, neuropathy, muscular pain, anxiety, depression and inflammation. Lee said if her favorite strains aren’t available, she tends toward strains that smell like tropical fruit and have floral notes. A budtender explained to her that smelling each strain is an important part of the selection process, because whatever sets off your olfactory receptors is usually a good indication of your experience with a strain. With all the knowledge Lee has gained as a medical cannabis consumer, she now works as a creative consultant to several companies in the cannabis industry, developing recipes and writing articles about her field research. Fifteen years ago, LD started consuming cannabis recreationally while in college. She continued somewhat regularly for about five years before quitting. But it wasn’t until about a year and a half ago that LD began using CBD — almost by accident. LD was given some cannabis (1:1 THC to CBD ratio) by a friend for her birthday, intended as a treatment for anxiety she experienced following a stressful event. Not really considering what effect consuming marijuana would have on any other part of her body, LD discovered by accident that using strains with that same 1:1 ratio helped reduce chronic pain in her reproductive area that was likely due to endometriosis. LD, like many happy consumers, preaches to everyone she knows about how well CBD works for her anxiety and insomnia. Cannabis has changed her life. Becky Garrison began consuming cannabis in high school and college on a recreational basis. After she moved to the Pacific Northwest in 2014, she looked for strains to reduce joint pain and relieve stress. For joint pain, Garrison prefers creams, both hemp- and cannabis-derived. As a result of using strains high in THC, Becky found that they improved her sleep, and over time she discovered that she prefers edibles high in THC to help her fall asleep. Becky isn’t faithful to specific strains. Instead, if she wants pain relief and to be creative so she can write and function, she goes for creams and flowers high in CBD. When she wants to chill her mind so she can sleep, she reaches for strains high in THC. If you are new to cannabis and are considering it for recreational or medicinal reasons, there is not a one-strain-fits-all answer. Estimates vary depending on where you look, but there are upward of 1,000 strains of cannabis. This is great news if you’ve tried a few and they didn’t perform as desired — you have seemingly endless options. It may take a while to find a strain that works for you, but you also may enjoy experimenting. I have a spreadsheet to keep myself organized, and when I find strains that work, I add details about them (THC to CBD ratio, the terpenes, how they made me feel, etc.). It’s a suggestion you can try as you are wading through the wonderful world of weed. This article was originally published on Big Buds Magazine and is reposted with permission.